On Calypso we carry 8 sails: the mainsail with three sets of reef points + a spare mainsail, the staysail, the yankee and a big 150% genoa (called “The Red Devil”). These are all tan bark (red) except for the new main. The two headsails are roller furling on the Spintec system which is fantastically robust and low-tech. When there is not enough wind to fill these sails, we deploy a lightwind drifter or our beloved nylon gennaker, which we call “The Bad Boy”. 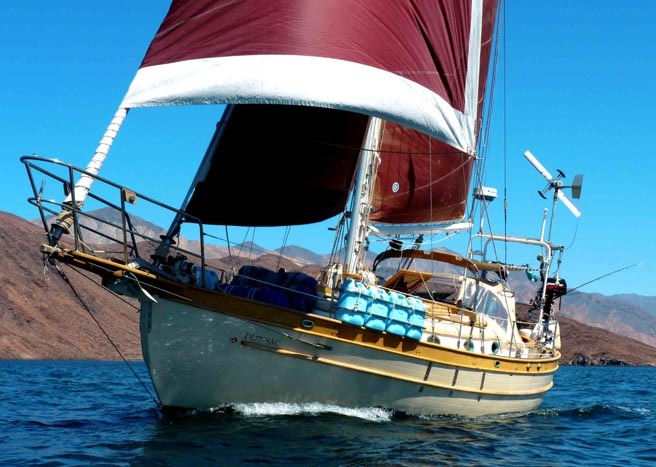 At anchor we use a riding sail off the backstay, which helps us to face into the wind. On top of our “Christmas wish list” there is a 100% jib. Although we don’t like to use it and we seldom do, we also carry a diesel engine, a 50 hp Perkins 4-108. We have 4 solar panels (4x50watt) and a Fourwinds wind generator, which charge our five batteries with a total of about 1000 amp hours. They are doing a very good job. We never have to start the engine to charge the batteries. We carry 140 gallons of fresh water and 175 litres ( 45 gallons) of diesel in our tanks. We also have another 10 gallons of fuel and 30 gallons of water in the jerry cans on deck. We use about 2.5 gallons of water per day between us, which means that we are self sufficient for about 2 months before we need to fill our tanks again (assuming there is no rain). We have three anchors. Our main anchor is a 44-pound Delta with 150 feet of 3/8 chain (and another 200 feet of nylon rode spliced to it), which shares the bowsprit with a 33-pound Bruce. A Lofrans-Tigres manual/electric windlass is used to raise and lower the anchors. When we anchor or leave an anchorage under sail (which we really love to do! ), we use the manual windlass because without the engine running the electric windlass would drain our batteries. On the stern we carry a Fortress FX-23 to keep our bow pointed into the swell on rolly anchorages. We have a West Marine inflatable dinghy with a Mercury 4hp outboard which we almost never use and only comes out of the bag when we have guests. We prefer to use our double inflatable kayak to go ashore, which is greener, quieter and keeps us fit. 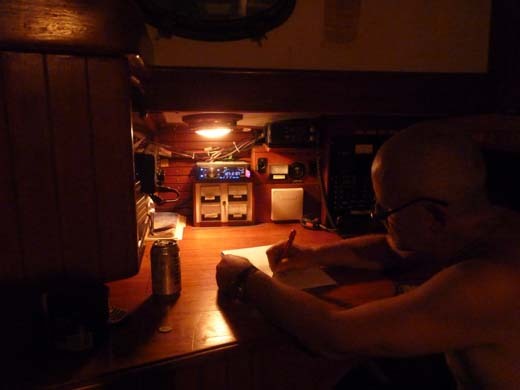 For short distance communication Calypso carries a Standard Horizon VHF and a handheld. For long distance communication we have an Icom 710 HF radio. Our call sign is KD0RSM. We also have a SCS Pactor II modem to send email via HF radio waves. 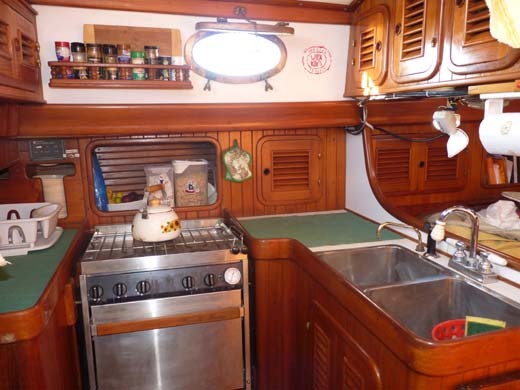 In the galley Calypso has a 12-volt refrigeration and a three burner propane stove with an oven (very often used to make lasagnas, pizzas, cookies and bread!). 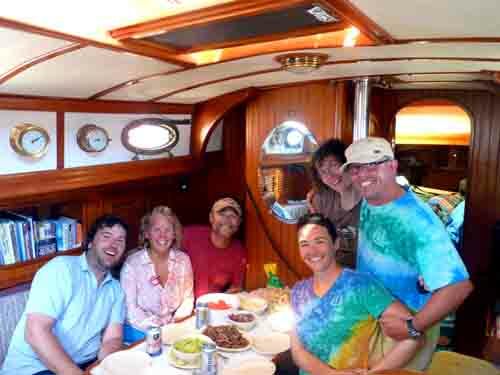 When is too hot to cook inside, the BBQ on the stern rail is a real blessing. We also have a Force 10 diesel heater which we have never had to use being mainly in the tropics. When we bought this boat she already carried many things which we consider a luxury – a 2000W power inverter, a water heater (for hot showers!) and a Furuno radar.We would never have bought these items because we don’t find them necessary, but since we have them, we spoil ourselves by using them. Our chartplotter is a Standard Horizon CP170C which is pretty old. That’s why we don’t rely only on it – we always have paper charts and we use Open CPN on both our laptops. Love your site, comments and content! I hope one day to sail my SC28 far and away but until then I have your site. Thanks Kurt!!! And we hope to meet you and your lovely boat somewhere in paradise. Don’t give up on your dream! Glad you liked it Aaron! Have you bought a boat yet? Are yiu planning to get gone or have you already left? 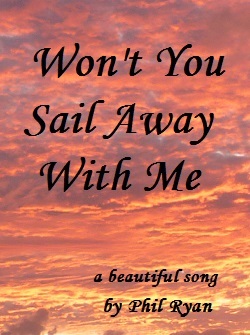 Let us know on sailingcalypso@gmail.com. 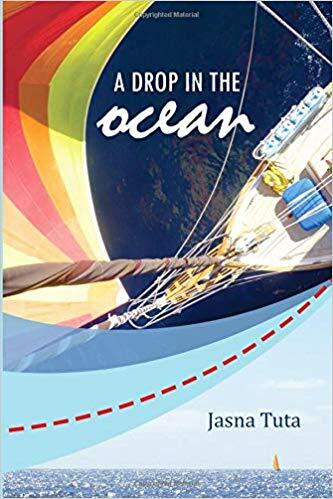 You all have really got me inspired after reading your book “Get Real, Get Gone” I am in my planning stages now of buying my boat and becoming a Sea Gypsy myself in 24 months! I have to say I love the Hans Christian/Union 36. I am leaning towards the Cabo Rico 34 myself. I just wanted to say hello and that I really enjoyed reading your book and following and living vicariously through your lifestyle!!!! Just started reading your book “Get Real, Get Gone”. Very inspiring and great, honest detail too. Giving the Sea Gypsy life some serious thought. Not sure where yet.. I’m in the Caribbean at the moment. Regardless, this book is money well invested. Hello: I read your book, just finished today. Thoroughly enjoyed it and the tips you have in it are really valuable information. I have been searching for the right sailboat for quite some time and as of yet, undecided as to what hull design to gravitate toward. Your sailboat being a double ender, what is your opinions of it compared to others without being double ended as for following seas etc.? Also, is your generator a portable or is it permanently mounted and what location, and is it diesel or gasoline? I like this idea as compared to having to run the boats engine to top off batteries. Thanks for the email. We are delighted you enjoyed the book and found it helpful. Many people will say that there is no great advantage to having a double-ender, but this has not been our experience. We have become so accustomed to how well-mannered Calypso is in a following sea, we were completely shocked when we recently delivered a very wide transomed Garcia 60 to Fiji. Furthermore, those wide transoms tend to slap the water at anchor and can make quite a racket. The only real disadvantage to double enders is that fitting self steering can be a challenge. Regarding generators: we dont have one. A well set up boat should be able to source its daily requirements from sustainable energy sources. This is something of a central theme of the book, so I am not sure where you got that idea from. Anyway, thanks again for getting in touch and email me any questions as they occour to you. Those people who say there is no advantage in a double ender obviously have not sailed in one. My Fisher 32 is impeccably behaved in any sort of a following sea. Hi R n J. My girlfriend bought me your book and I’ve just finished it. I can honestly say it’s the first book since The Cat in the Hat that I’ve finished and immediately turned back to page one! Your attitude seems to exactly echo our own and I’ve learnt so much from you and your book. I’m now going back through the pages with Post-it notes and a highlighter! In fact, you’ve made me discard EVERYTHING we thought we had decided upon with our sea quest. So, thanks for that! Ha Ha! Sorry about that! It all works out well in the end though…… Let us know if you have any questions so we can cause you even more trouble. Loving your book and your way of leaving. boat is in Greece and that will be our place to start, may be…. Just dropping a word here. Just finished reading your book. Great motivation. On the look for the right boat. Looking to escape in about 3 years from now. Thanks for the emails and help. We’ll meet one day somewhere out there! Keep savin the dough while you can buddy! ( I assume that the book was a joint effort). My wife brought it for me for Christmas. Perhaps she is trying to tell me something? You have definitely struck a cord with me. Maybe I have found my home at last. I totally agree with your comments about anchors. What do think of pacific seacrafts as a possible boat! Thanks for getting in touch. I have sent a message to your email address. I seem to be concerned a lot these days with water(the lack of) I see you carry water on deck do have any problems with water spoiling? No. Never had a problem. We always rotate ours anyway (we pour them intothe main tank in the bilge as soon as there is space) and if we have a long passage to go on, they are only 1/3 full. This is because a lot of weight on the rails can adversely affect your boat’s sailing characteristics and reduce her ability to right herself in a knock down. Obviously this is not a problem coastal day sailing, so we fill em! When we head offshore, they are just filled enough to give is something to drink in the life raft without adding extra weight to the rail. Thanks for posting. I have sent a message to your email address. It is a free software to turn your laptop into an electronic chart plotter. Hi Guy’s, hope all is well. Am reading your book for the 2nd time, it’s great.Been looking at boats again. What do you think of the Westsail 32 or Tayana 37. Both are full keel. Glad to see you are back on the righteous path! We are VERY familiar with the Tayana 37 as we practically own one (the T37was designer Bob Perry’s ‘revenge’ boat after being stiffed on the design commission for the Hans Christian 36 and so is practically identical to Calypso). We are also very familiar with the Westsail 32. Both make excellent cruising boats (get one WITHOUT those bloody teak decks) being robustly built. Did you see the boat that survived the ‘perfecf storm’? A Westsail 32 called Satori. Both boats have great owners’ associations which are a great source of info. Westsail.org, tognews.com. got any links of the ones you are looking at? Have you visited Wellington, New Zealand yet. You must, if only to drag me off my complacent backside, put me on a boat and push me out of Wellington harbour! Just wanted to say how much we are enjoying your book, which has brought our escape forward substantially and saved us many thousands into the bargain, so we definitely owe you a few drinks. Saw you 2 weeks ago on the Ben Fogle re run here in UK. Very Best Wishes to you both. Just this minute finished your book. Good work! My investment was justified. One question — if not teak, what? Thanks for getting in touch. Glad you like the book and considered ot worth your time (we would be very grateful if you could repeat your kind sentiments on the review page of Amazon). The answer to your question is ‘virtually anything else’. The way your question was phrased suggests that you are perhaps under the impression that there is little alternative to teak decks, when the truth is that most boats do not have teak decks. Most fibreglass boats have fibreglass decks (often with a central core of marine ply, end grain balsa or hi tech synthetic like Nolex) for insulation. Steel boats often have steel decks, aluminium boats, aluminium decks, ferro boats, ferro decks, etc etc. In fact, teak decks are far from the norm (thank goodness) so there is no reason to buy an old boat with teak decks. New boats with teak decks are probably okay, but our book is aimed at the budget sailor trying to get to sea on pennies, so avoid old teak decks like the plague. To be fair, l dont even like teak decks on new boats as they add weight up high, just where you dont need it and can still be leaky. All round silly idea really. Thanks again for getting in touch and keep us posted on your progress. Great book. As The China Study (Campbell) does for health; your book cuts through what we are encouraged to believe, to reveal in clear language what we need to know. How is it even possible for yacht brochures/web pages to not mention the rudder? And worse to highlight trivial features instead. Equally, do any brokers have keel/rudder design as a searchable parameter? Hopefully, as the buying public becomes more educated, suppliers will take note. I totally agree with everything you say – particularly the tendency of marketeers to highlight the trivial. The constant repetition of the need for this or that gadget has left the less informed sailor believing that not having the latest everything is irresponsible. Look at some of our negative reviews on Amazon: Rich folks frothing at the mouth because we dont have all the blinking gadgets while setting off to sea in their fin-keeled, spade ruddered yoghurt pot of the ‘highest specification’. The power of advertising in focus! 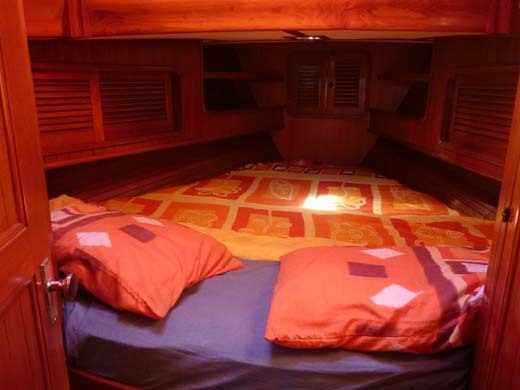 It is certainly annoying that seaworthy construction is considered an optional extra or less important than the galley taps, but not really a mystery when you consider the new market is generally driven by non-sailors, playboys and bucket-listers. The boat builders are doing what they have to in response to the uninformed consumer – it is a hard environment for boat builders! What l do object to though is those same boats being also marketed as ‘bluewater cruisers’. This is as close to criminally negligent as you can get without actually driving into somebody. Am just reaching the end of a 30 year career in the Met Police as a detective on the Flying Squad. Your book and tales are absolutely inspirational and thought provoking. I’m currently researching my yacht for my travels but just wanted to thank you as your experiences have seriously affected my decision making and plans. You’re a great couple. THANK YOU. What kind words Jason! Thanks a bunch. I have sent you an email so you can keep us informed of your adventures and ask any questions. Just read then re read your book. Feeling inspired! Thank you. Rick, I too suffer from M.I.A.S. In fact my house is starting to resemble the scene from Spinal Tap! (Do you know the one? …don’t touch that…don’t even look at it…ha). I also suffer a more serious condition. B.A.S (boat aquisition syndrome). The good news is that it is very easy to diagnose as when the season comes to an end and you are wondering where the hell you can store them all? You know you got it! Looking forward to exploring this site. just a short note to say how much I enjoyed reading your excellent book. I’m now even more inspired to Get Gone. Hopefully one and a bit more years of saving plus tying up some loose ends within that time and my adventures shall begin. Calypso looks a lovely, seaworthy boat. Thanks for the kind words. We are delighted that you liked the book so much and hope you will come and join is out here. What are your plans? I see you already have a boat. Thanks also for leaving such a killer review – much appreciated! you’re very welcome regarding the review. My plans initially are to see all the bits of the UK and Ireland that I haven’t yet seen, then the Netherlands and Baltic. Possibly for the first 2 or 3 years I may just cruise the summer months and pick up a job for the winter to top up the funds. Then I would like to head south… France, Spain, Portugal and into the Med. It’s all pretty fluid and I will just see how I get on. I’m already living aboard but still working. 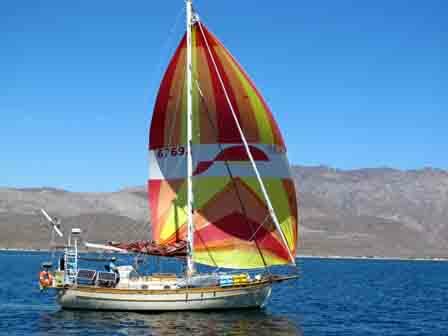 The boat is a Danish LM 27 (long keel, canoe stern) and she is a terrific boat for my needs. I may shoot you off an email with specific questions! bought your book after seeing you on the TV, I have never seen two people smile so much!! I’ve got a Hustler 30 from 1972, it’s a great little boat but too small to live aboard so I’m looking to get something a bit bigger so I can hone my gypsy skills! Trouble is I see very few boats for sale in the UK that I actually like, I really hate modern production boats. All the best and keep smiling! Hi Mickey, Thanks for getting in touch, I will answer by email when I hit the computer! Thanks Jason. Why are you in Tokyo wondering what to do next? 🙂 Drop us an email on sailingcalypso@gmail.com if you would like some suggestions! we just started reading your book ” get real…”( i read- he listens) and we truely enjoy it very much.you give essential and good information and it is nice to read.above all you are another source of inspiring sea gypsies who encouage us to get real and go for our dream to become sea gypsies ourselves soon! thank you for sharing your knowledge! its great! until we will find the right boat for us….we read..we think…we get inspired and prepared…it will take a while but it has already put a smile on our faces! thanks again for sharing what you have learned and fair winds to you! I have just finished reading your book. Congratulations, you folks provide very useful tips. The book made me laugh with the truthful comments and stories as well (couples yelling at each other while docking…). I found it so interesting that I bought a second copy for a friend who also has plans to sail away some day. I wish you folks good winds and a peaceful life ! Thanks for those kind words Rodrigo! Let us know if you have any questions -always happy to help! I just finished your book and I’ll read it again. I am a Brazilian mid-age guy and planning to live in Ubatuba in two years, a city at São Paulo North Shore. Worth a try to know it and region, very beautiful anchorages. Well, the book gave me a new vision for sea living and you have a good sense of humor. I don’t know if I’ll get all the things done, but I’ll try most of them, cause I’ve to convince my wife and it´s not easy. The first difficulty is to find a boat with keel and rudder that you emphatysed. Most boats that we´ve seen are like book figure (e) keel and rudder. Our plans will be explore Brazilian shore from South to North with no hurry and arrive in Caribean. When we came back we ‘ll problably work with boat charter and this means a 38 or 40-foot boat. Thanks for the tips and advices. I wish good winds for both. Thanks Carlos! I have sent you an email. HI just finished reading your book, we have a boat in the UK. The tips on anchoring were very good, but the best thing was the home made washing machine, we will be trying that out. I heard your story on a podcast thru Boat Radio and then bought your book. It was the best decision I’ve made since Crissy and I decided to start saving for our future boat and cruising life together! Your advice is invaluable! We’ve both been sailing (racing) for 20 years and had so many ill conceived notions about what we thought we knew. Your book set us straight, or straighter, or at least down towards the right path. We’re in the saving phase, and minimizing and phase and looking for “the right boat” phase. We’re taking our time and plan on making the purchase in a few years then spend a few years sailing the Great Lakes (where we live) while outfitting the boat and preparing to shove off for good. Thanks so very much! Ha ha! I can imagine what 20 years of racing can do to your head! thanks for the positive feedback. I will PM you so that we can follow your progress. Thanks again! after reading your book “get real, get going” I’m on the way to sell my motorboat. In nearest future, I hope to buy a steel sailboat 33feet long to go in the baltic see and, after some time trainee the sailing, I will go south. By the way, I’m 60 years old and I have to go single handed. There are only some experience in the past with sailboats but nothing, I can use today. The ship will get a windvane steering at first. Thanks Peter… you are our first reviewer for the German version! I will drop you an email so we can keep in touch. thanks again! Thanks you Two for the book. Loved it. Looking to purchase in the next few months on the East Coast of Oz. Well written, thoughtful and honest. Love your sense of humour. PS I loved Aputaki if you get back over there. They even have a careenage their. Glad you liked the book! Aputaki is fab is it not? I have been looking on the East Coast too – maybe you would like to hear about what I have seen around. I will drop you an email.